Don't give me a lot of grief about lessons, fitness, etc. I take lessons, played many decades, didn't have junior training so not looking for advice from seniors who grew up taking lessons from pros. Currently taking lessons from a D1 coach and hitting with several 11-12.5 UTR kids. Play several times a week with 4.0 and above players. Used a 10.2oz 116" head HH racket last night. I was able to generate enough RHS to bamboozle the 25 yr old 5.0. Everything else worked OK. I am interested in recommendations from other 65 yr old+ folks what "big head" rackets they like. 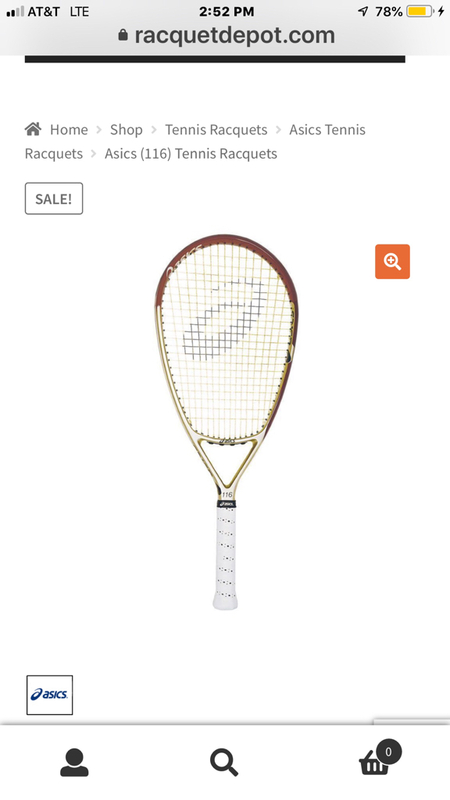 I am not interested in opinions on Wilson Kfactor, Head Ti6, Volkl V2, Prince Premier 120, but I particularly interested in recommendations concerning big rackets from the 90s. I have a Prince Extender 116 and I thought it play well. There is an ASICS frame John Powless used that is remarkably good. Not sure of the model name. Good luck!! Uh, isn’t that a racquetball stick? Back in the day every senior champion from the 55+ division on up played with a Weed. I can't testify as to what their frames are like now, but they are still in business and they have always been super-oversize specialists, so they are maybe worth a look. Try the O3 Silver @graycrait! It’s a beast on the serve!!!! My father (who turns 84 this year) used the Pure Drive 110 for the better part of his late 60s & early 70s. Prior to that, it was the trusty Wilson Profile 110. @monfils is my homeboy and all others, I've spent more on rackets this month than I have in a long time: 2 x Michael Chang Titanium MPs, another Prince Graphite Extender and my last (hopefully) Prince Classic Graphite 100LB. With an additional 30 Prince 90s from the 80s and a dozen Prince OSs I better not spring for any more rackets. I think @Shroud can tell you where to find Profile grommets! Retired Floridian mentioned he can get all the Weeds he wants under $50 per in Miramar. Is Retired Floridian a TT member name? I can't find such a member to contact. @Ronaldo , It is hard for me to believe that there are not literally hundreds of widows/widowers throughout the US who have a Weed left by their dear deceased... Are they all so savvy about used racket prices? Heck, a tennis widow/widower was left a long-time before their spouse was deceased. Pity, their spouse took the Weed with them, buried upside down. @Ronaldo , That song came out when I was 15, swinging a Davis Imperial. Look up a racket company called Vortex in California. They make some outstanding rackets for older fit players. I'm 60 and I use one of their rackets and it has a 125 sq. inch head and it feels as maneuverable as a 100 sq. in. Babolat or Head. ^^ I think people using the frame above think they may require 3 or 4 arms. If you acquire one, Weed has special stringing instructions on their web site. KlipperUSA has the basics down, but not the requirements to string the top and last crosses different tensions. For frames with extra wide string spacing, you really need 15 Ga string or Kevlar. Even 15L is marginally too thin. You can use racquetfinder to check out older frames with minimum face size of 125. Prince, Wilson, Volkl and Dunlop all made REALLY large OS. I can't play with that thing with two hands but one handed I can make it work - sort of. A couple of guys at the doubles league on Weds night told me to leave it home from now on. So I pulled out that Prince Extender last Weds nite - that got 'em going again. They get so wound about winning over having fun. This will be my last season for letting those guys talk me into playing leagues. Grim determination to win an ugly point for no reason other than misplaced ego. And then there are the line calls, jeesh. At least I got 3 of them to start taking lessons. I couldn't understand why they wanted the same skill set they had in high school 30-40+ yrs later when they are losing a step or three. I didn't say it but they might as well have just kept using wood rackets. By and large they play with 98/100" stiff Babolats with poly they rarely cut out. However, one guy I have had the pleasure to hit with in a different level league uses a giant headed Asics but he plays in the USTA 85s. He is a crafty doubles player, moves well. He also plays on a national champion over 80s softball team. He has a live arm. ^^ You wouldn't see that kind of uptight doubles league behavior if Weeds were legalized. Can’t believe I forgot to mention the Original ORIGINAL Pro Staff 125!!!! I can't believe I didn't know about the POG 125 until 5 minutes ago. I ran across it when I researched the PS 125 you mentioned. Dang it. I told myself I was going on a racket buying moratorium after springing for those Michael Change MP Longbodys. That is a neat comparison. I have a Mag Pro 90 and more that several of the other two. The Mag Pro 90 is an ATG!! For my own mental health, I am starting to write down more things, but this means more scraps of paper, which leads to 'Why did I write this down?' Forgetaboutit! I use Luxilon 4G 16L @ 55 lbs.